Is underpinned by sound research and a robust Employee Value Proposition (EVP). A well conceived employer brand will really help you stand out in a crowded recruitment marketplace. And once you stand out it’s far more likely that candidates will apply to you. However, it’s important to realise that an employer brand doesn’t stop at the attraction phase. 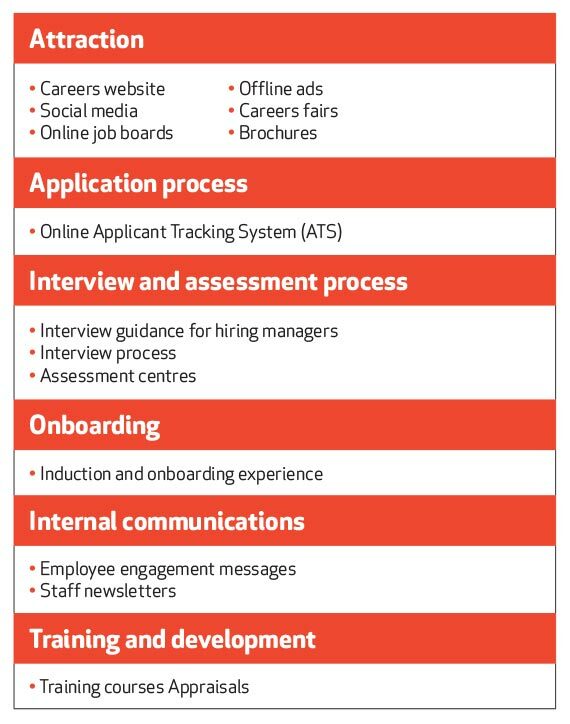 The chart below shows all of the touch points where a typical candidate can engage with your employer brand. There’s more detail below the chart. The application phase is the critical first phase after the candidate sees your gorgeous new employer brand. It’s stating the obvious but it’s critical that the application process matches your brand values. There’s no point shouting about your bold, innovative brand when the application process is clunky and confusing. Assessments are becoming increasingly common as a route to ensure that the candidate you’ve chosen matches your recruitment criteria. Like the interview process, they’re also a fantastic forum for communicating your employer brand. Think bold and innovative. Not clunky and confusing. Onboarding is a much under-looked part of the candidate journey. Those first few days as an employee in a new company are vital for forging opinions. How many of us have had a bad, clumsy experience? In fact one of the employer branding agencies I worked at in the UK produced a guide called ‘The Little Book of Crap First Days’. It became a bestseller in EB circles! Think of the opportunity that exists to enhance your employer brand with a strategically planned onboarding process. Once candidates have been successfully on-boarded through your slick onboarding process, there are still plenty of opportunities to continue your employer brand messages. Throughout their careers, you can create internal comms themes that are all aligned to your employer brand. And of course every employee can be exposed to your employer brand through consistently applied training and development messages. The key to a successful employer brand is consistency. The end-result is engaged candidate awareness.